Reach Cape Air travelers in flight to your destination all year round. 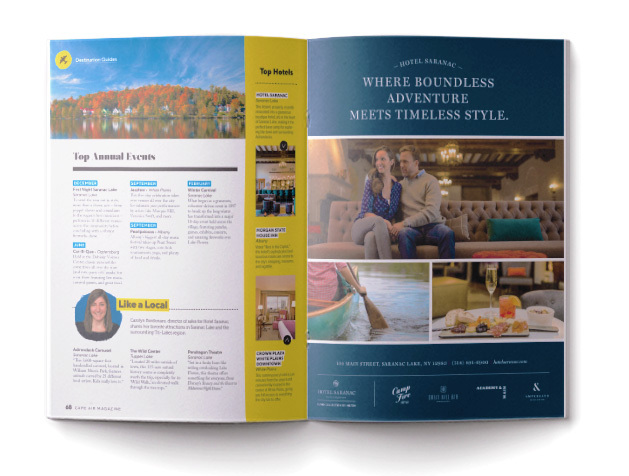 Cape Air Magazine is the exclusive publication in every seat pocket, on every plane. And since most flights don’t allow the use of any electronic devices, you can rest assured that readers are actively engaged in every page. Take a look at the current issue here. Each issue is in circulation for three months. Rates effective with all 2019 magazine issues. Access and target travelers before and after every trip. Cape Air nurtures the customer journey by emailing every guest three days before the flight departs and three days after each return. Your digital ad will be served up to travelers within your desired destination. Email ad placements will be live for three months, the same duration as each magazine issue. Space is very limited; only three digital ads are available!